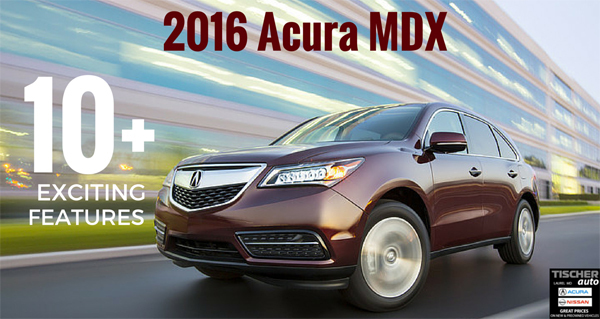 The 2016 Acura MDX, America’s best-selling luxury 3-row SUV, is here at the dealership! Acura has improved the MDX for the 2016 model year with multiple new features and technologies, including a more advanced powertrain, and an expanded model range. In other words, more MDX in the MDX! Torque-vectoring effectiveness has been improved to help elevate responsiveness, agility, and stability. Both the 2016 MDX and MDX with Technology Package models can be equipped with AcuraWatch. The MDX with Advance Package comes standard with AcuraWatch. Tire Pressure Monitoring System fill assist that sounds an audible alert when the driver inflates the tire to the correct pressure. This entry was posted in Acura News and tagged 2016 acura mdx, Acura dealership, Acura MDX, new Acura MDX by Tischer Acura Nissan. Bookmark the permalink.